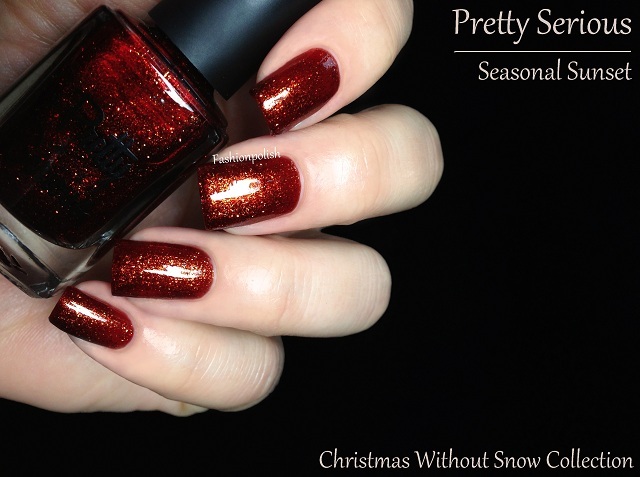 Fashion Polish: Pretty Serious Cosmetics Christmas Without Snow Collection! 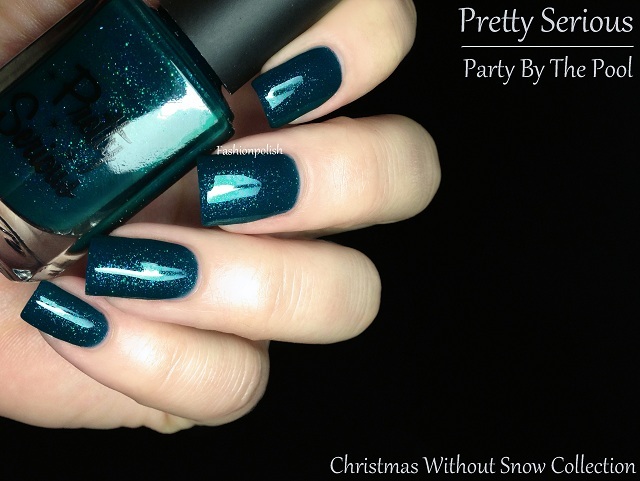 Pretty Serious Cosmetics Christmas Without Snow Collection! If you're already into Spring pastel collections, I hope you won't mind a little rewind to take a look at the Pretty Serious Cosmetics Holiday collection, Christmas Without Snow, because I must warn you, I am all over these beauties! Blue Gums on Boxing Day is a warm green with a beautiful blue shimmer. 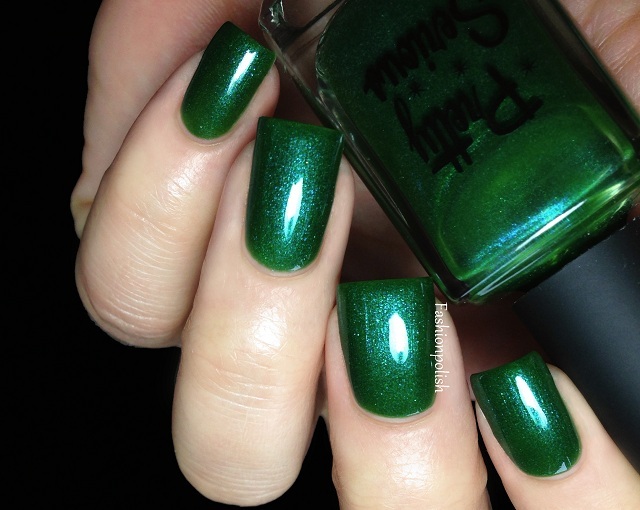 If you own RBL Jack, no dupe alert, this is much greener and warmer so you can totally justify owning both LOL. I really loved it but I also love applying it : pure perfection! Butter smooth and completely opaque in 2 coats. 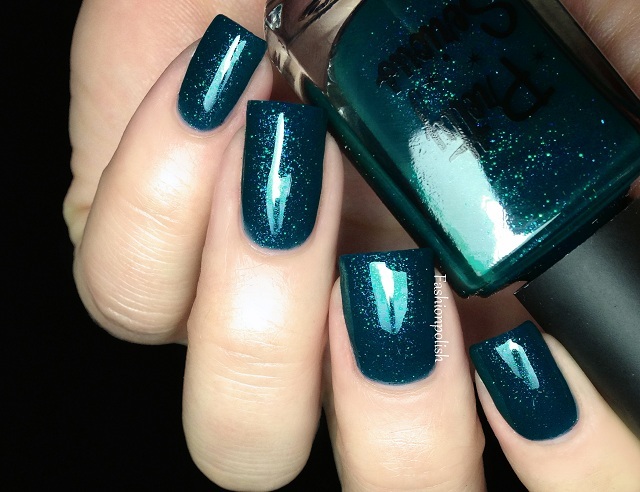 Party By The Pool is a vibrant teal with specks of green and blue shimmers. 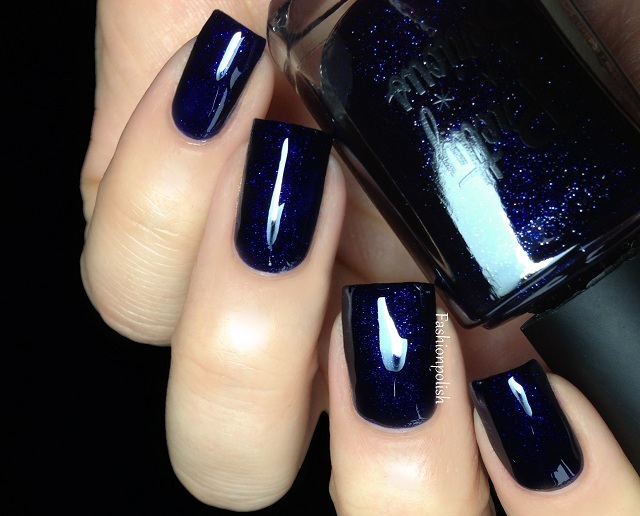 It's one of those polishes that you have to see for yourself to truly appreciate their beauty. Formula was different from Blue Gums on Boxing Day, I found it a little thicker and more sheer somehow but it was still easy to work with. This is 3 thin coats plus topcoat. 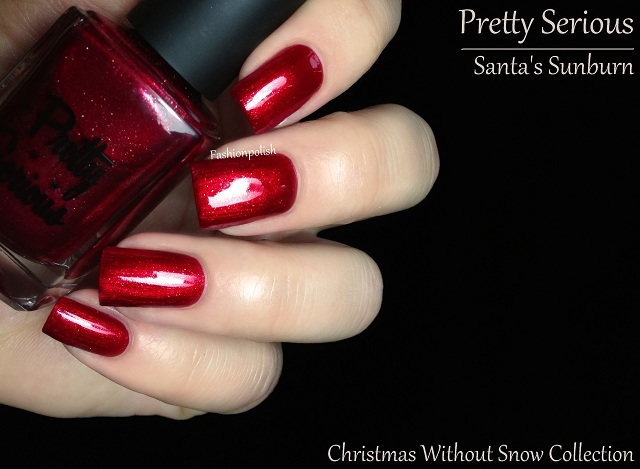 Santa's Sunburn is a saturated metallic red shimmer with silver sparkles. I still can't get over how insanely gorgeous it is AND I used 1 single coat! Best, easiest, most opaque formula ever! Did I mention I love red now? 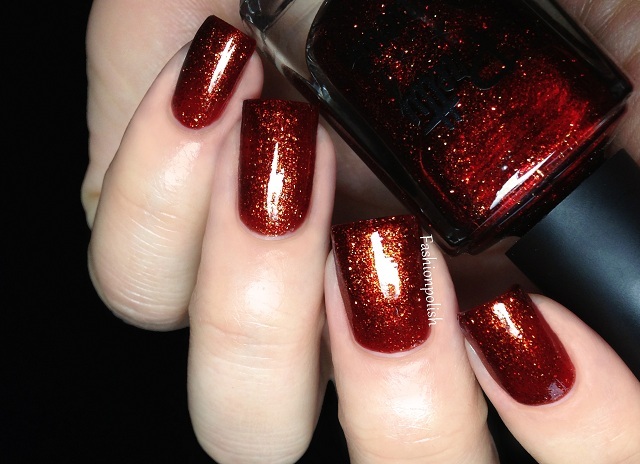 Seasonal Sunset is a super sparkly rusty copper shimmer, leaning glass fleck. It's very intense in real life and reflects the light beautifully. Formula was on the thick side due to the crazy amount of gold and copper shimmer but didn't give me any trouble. You're looking at 2 coats plus topcoat. 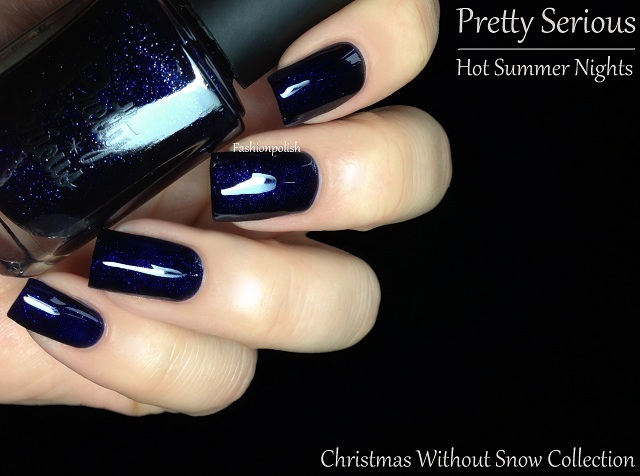 Hot Summer Nights is a stunning dark midnight blue shimmer, a ONE coater midnight blue shimmer! Formula was simply flawless and the polish seemed to flow effortlessly on the nails. One coat plus topcoat here. 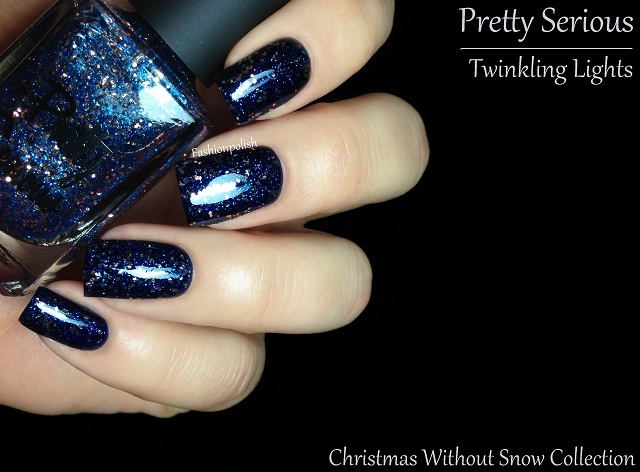 Twinkling Lights is a mix of very small sapphire blue glitter combined with bigger copper hexes in a clear base. I decided to pair it with Hot Summer Nights and it completely lit up my manicure, transforming the dark, mysterious and subtle shimmer into a sparkly sky. I used one coat over HSN (plus topcoat here) and both glitter pay off and distribution were perfect. This is my very first experience with Pretty Serious Cosmetics and I feel like I've just opened a pandora's box : gorgeous colors and amazing formulas, how am I supposed to resist now? My two cents, you'll LOVE them! 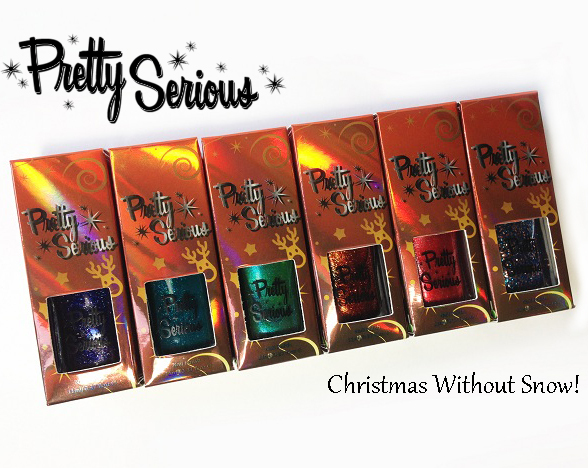 Pretty Serious Cosmetics nail polish line is Big 3 Free, Formaldehyde and Resin Free and retails for $9.99 AUD each. For more information, please refer to pretty-serious.com and like / follow Pretty Serious on Facebook or Twitter to be updated on the brand's latest news and offers. I love these swatches. They're so damn pretty! I want to buy the whole collection - they're next on my lemmings list to kill! Ooooh, these jewel tones are seriously gorgeous! Love them all (especially Hot Summer Nights and Party by the Pool)!!! Lee Ann Llarowe, where are you? ;) These are stunnnnnnnnning. I'm pining for the last two blues and the teal. Swoon. Your swatches are amazing! I think you may have made me break my promise to myself about not buying more polish for a while :-/ eeek! Party by the Pool looks stunning! Was there any staining? Stop everything!!!! What an awesome collection!! I need them all!!!! NOW!! Where can I find them? twinkling lights and santa's sunburn...love it! Want! Wow....these are all gorgeous, but I think I'm in love with the green the most. 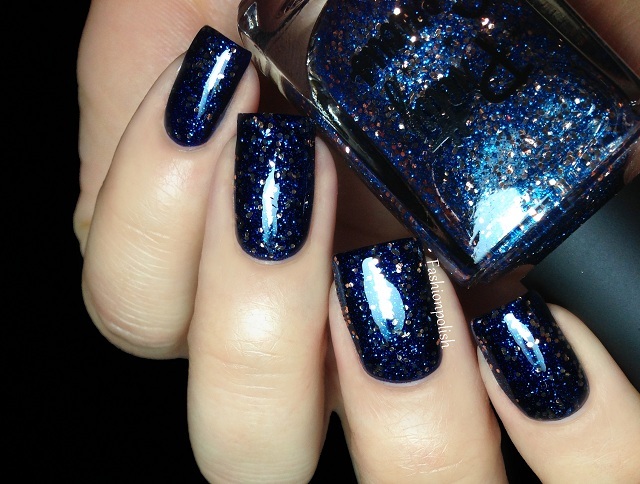 That blue shimmer is awesome. Pretty Serious polishes are awesome, I own about 10 now and love them! Must get all of these also. I need to have some of these! OMG! What a beautiful look, Wendy! When does this Christmas collection come out? Rubs hands together in anticipation.